Home / Curly Hair • Dry Hair • PJ Alert • Product Reviews / Does the New Dove Quench Absolute Line with Buriti Oil Work Wonders on Curly Hair? Does the New Dove Quench Absolute Line with Buriti Oil Work Wonders on Curly Hair? A significant amount of women over the last few years have begun to embrace their natural hair texture leading to a drop in sales of straightening and chemical processing products for hair care companies. It was only a matter of time before companies jumped on the train to create hair care products targeted at women who fall into this category in a bid to capture the market. When I found out about the new Dove Quench Absolute line for curly hair, I was intrigued. My intrigue turned into intense interest when I discovered it also contains buriti oil. I switched into research mode to find out more about this oil, what it does and if it’s inclusion in the line makes any difference to curly hair. 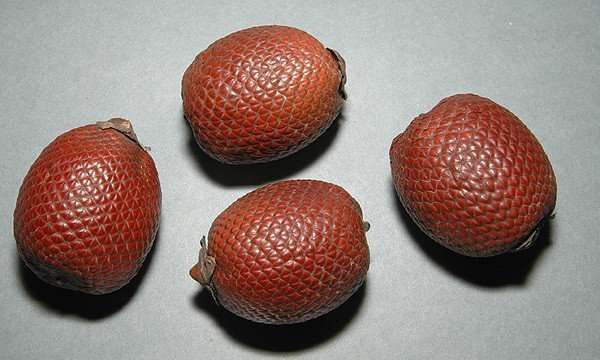 Buriti oil comes from a palm tree aka as muaritia flexuosa, which grows in tropical South America. The fruit is edible and has a high Vitamin C content. 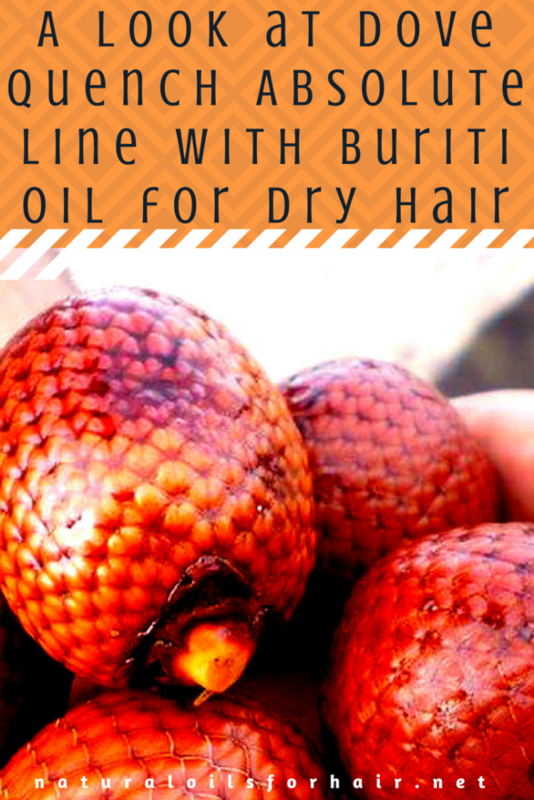 Buriti oil is similar to red palm oil, which is also derived from a type of palm tree that grows primarily in Africa. You can read an earlier article about this here – Extra Sheen for Dry & Dull Hair with Red Palm Oil. The fruits are edible and have the same orange-reddish color. The trees are used to produce palm wine. High amounts of beta-carotene and tocopherols in both oils. Both oils are effective treatments for dry and dull hair. Both oils are rich in Vitamin A.
Additionally, buriti oil appears to work as an effective sunscreen, which improves skin elasticity. It is also useful for treating burns. What’s Dove Quench Absolute Line? 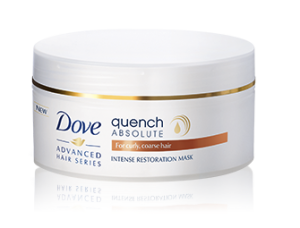 The Dove Quench Absolute Line includes a shampoo, conditioner, restoration mask and crème serum. Water (Aqua), Sodium Laureth Sulfate, Cocomidopropyl Betaine, Glycerin, Glycol Distearate, Dimethiconol, Fragrance (Parfum), Sodium Chloride, Carbomer, Gluconolactone, Citric Acid, Guar Hydroxypropyltrimonium Chloride, Tea-Dodecylbenzenesulfonate, Sodium Sulfate, Trehalose, Tetrasodium Edta, DMDM Hydantion, PPG-9, Propylene Glycol, Peg-45M, Arginine, Lysine HCL, Mauritia Flexuosa Fruit Oil, Dipropylene Glycol, C10-40 Isoalkylamidopropylethyldimonium Ethosulfate, Hydrolyzed Keratin, Methlchloroisothiazolinone, Methylisothiazolinone, Mica (CL 77019), Titanium Dioxide (CL 77891), Yellow 5 (CL 19140), Red 33 (CL 17200), Blue 1 (CL 42090). Water (Aqua), Cetearyl Alcohol, Dimethicone, Stearamidopropyl Dimethylamine, Behentrimonium Chloride, Fragrance (Parfum), Glycerin, Dipropylene Glycol, Lactic Acid, Amodimethicone, Potassium Chloride, Disodium Edta, Gluconolactone, Trehalose, Propylene Glycol, DMDM Hydantoin, Peg-7 Propylheptyl Ether, Cetrimonium Chloride, Arginine, Lysine HCL, Mauritia Flexuosa Fruit Oil, Sodium Sulfate, C10-40 Isoalkylamidopropylethyldimonium Ethosulfate, Hydrolyzed Keratin, Methlchloroisothiazolinone, Methylisothiazolinone, Yellow 5 (CL 19140), Red 33 (CL 17200), Blue 1 (CL 42090). Water (Aqua), Cetearyl Alcohol, Behentrimonium Chloride, Dimethicone, Dipropylene Glycol, Paraffin, Hydroxypropyl Starch Phosphate, Fragrance (Parfum), Glycerin, Lactic Acid, DMDM Hydantoin, Amodimethicone, Hydroxyethylcellulose, Gluconolactone, Trehalose, Propylene Glycol, Disodium Edta, Peg-7 Propylheptyl Ether, Cetrimonium Chloride, Iodopropynyl Butylcarbamate, Arginine, Lysine HCL, Mauritia Flexuosa Fruit Oil, Sodium Sulfate, C10-40 Isoalkylamidoproplethydimonium Ethosuflate, Hydrolyzed Keratin, Yellow 5 (CL 19140), Red 33 (CL 17200), Blue 1 (CL 42090). Water (Aqua), Dimethicone, Cyclopentasiloxane, Glycerin, Dimethiconol, Propylene Glycol, Polyacrylamide, Phenyl Trimethicone, Fragrance (Parfum), C3-14 Isoparaffin, Peg-8 Methicone, DmDm Hydantoin, Butylene Glycol, Arginine, Lysine HCL, Mauritia Flexuosa Fruit Oil, Iodopropnyl Butylcarbamate, Dipropylene Glycol, C10-40 Isoalkylamidoproplethydimonium, Ethosuflate, Hydrolyzed Keratin, Disodium Edta. I’m not feeling the ingredients highlighted in red above and the buriti oil is listed farther down the list so uncertain just how much of it is contained in each product. My hair is sensitive and prone to product build-up among other things using a lot of the ingredients above. Even though the PJ in me is crying out for that restorative mask, I have decided to pass on the line. Dove Absolute Quench Creme Serum Reviews. I will be trying the buriti oil instead and comparing it to the red palm oil to see if one works better than the other or if they work more effectively when combined. Stay tuned for that article shortly.